This week (October 24–29) marks the anniversary of the Great Crash, a cataclysm pushed to the foreground by events of recent years—although for many Americans, the cause of the 1929 calamity is at best an incomprehensible, nebulous “house of cards” or “Ponzi scheme” (which, to great extent, it was). In his enduringly popular account, The Great Crash, 1929, the economist John Kenneth Galbraith explains, in very clear terms, exactly what happened. In one now-famous chapter, he describes how, during the late 1920s, it seemed everybody in the nation was buying stocks to get rich quick. Rather than wondering if the run-up was fueled by little more than unbridled imagination and misguided optimism, some Wall Street experts sincerely worried “that the country might be running out of common stock,” a problem they believed was a major cause of stocks’ high prices. So various ways to increase investment opportunities were invented and offered to the public. Which brings us to Goldman, Sachs and Company. 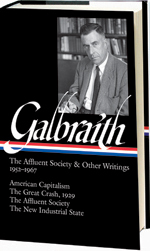 In the final section of his chapter on investment trusts, Galbraith describes the unique and outsized role the company had in the inevitable debacle, with total losses that, in today’s dollars, would equal about $475 billion. Goldman, Sachs and Company, an investment banking and brokerage partnership, came rather late to the investment trust business. Not until December 4, 1928, less than a year before the stock market crash, did it sponsor the Goldman Sachs Trading Corporation, its initial venture in the field. However, rarely, if ever, in history has an enterprise grown as the Goldman Sachs Trading Corporation and its offspring grew in the months ahead. . . . If you don't see the full story below, click here (PDF) or click here (Google Docs) to read it—free! scary scary scary. the fed the treasury and wall street all under the control of this entity now referred to as 'government sax'. congress and senate completely in the pocket these oligarchs and plutocrats ... terrible men like bernanke and paulson in charge of our economy - a president who forks over billions to them on demand and no expectation of accountability.... our future in the hands of heartless kleptocrats. when threatened by the law they settle out of court and keep the evidence of their wrong-doing secret. will anyone take up the cause of the common citizen?